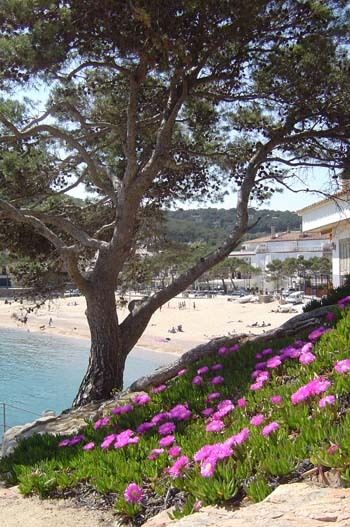 Just north of Palamos (around 20 minutes by car or taxi), lies the pictureque cove of Tamariu. This has long been a secret haunt for Catalans coming up from Barcelona: you'll see why when you get there. Just a small collection of houses that run around a small sandy bay this is one of the nicest beaches on the coast. Tamariu is paradise if your idea of a good day out is a lazy lunch al fresco under the pines just behind the beach, followed by a laze on the sand or perhaps a refreshing swim in the Med (if you can waddle that far after 3 courses and a few glasses of chilled white wine from the Penedes region). You can walk along the coastline south to Llafranc (this is about half a day's walk there and back, but you'll easily get a taxi from Llafranc if you only want to go one way. The path can get a little washed away, particularly at the Tamariu end, so don't attempt this unless you have a good pair of walking shoes or trainers, as there is a bit of clambering to be done. There are around 5 seafront restaurants to choose from at Tamariu. We tend to head for the Hotel Tamariu which is a family run hotel on the southern end of the beach, as the food is great here, but we have also tried the other restauruants along the beach and have had no complaints. All the restaurants serve very fresh produce. Make sure you get there in good time in the summer months, particularly at the weekends (remember lunch in Spain is generally from 2 to 4, so if you get there for an aperitif at 1.30 you'll be safe. Tamariu Beach seen from the north side of Tamaríu Cove.